I just happen to see the 2008 Cruisers 420 Express with IPS. Cruisers did one heck of a job with this layout! I'm really impressed with the classy design of the sole, cockpit & helm. Very well thought out. Engine area is a good size & layout too. Nice job all around. I had seen the 39 but felt it was too much for too little but this boat has got my attention. I'm told in 2009 it will be offered in a coupe full glass no canvass? Has anyone driven this boat for some cruising speeds? I don't see Boat test has any testing yet? I have not seen the boat yet but historicity Cruisers gives a lot of boat for the money, always great use of every inch of space, very good sea manors for design and over all good usability! Hi Andy, maybe Ramsport will have some more info. If you get a chance to see this one take a look. The IPS allowed them to make the engine room smaller but it's plenty for the IPS system. The extra room they used for the layouts interior. Very nice job. The cabin is exactly as Cruisers' previous 3870 Express, with some modification of finishes of course. Funny how "model numbers" have gone up huh? I personally don't like the lines of this coupe, the proportions of the top look odd to me. But it's a nice boat with tons of space! Looking at the layout drawing of the cockpit posted by Andy, I just noticed even the cockpit is laid out the same as the 3870. Looks like this is really the same boat with some hull modification for IPS, a coupe top and updated finishes. Doesn't seem to me that IPS allowed them any more room to make any changes to the cabin though, it's the same. Ernesto, I think you are right...same basic layout as the 3870. I really like the 3870 but the galley on the 3870 is very small for that size boat. My cruisers 3372 had a better galley IMO than the 3870 does but they have increased it slightly for the 420 (got rid of the full size fridge and put a small counter top on a half sized fridge in the 420). I like the coupe lines alright but I hope everyone who buys one knows they are going to be running that genset 24/7 when away from the dock if they are anywhere near the south. 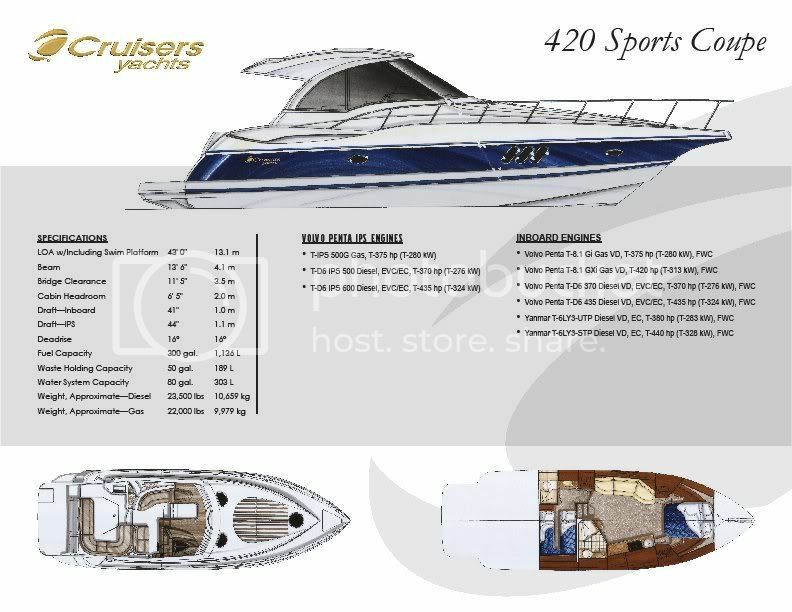 What's interesting is that the new 420 Coupe is closely related to (an evolution of) the 3870... And yet the 420 Express Art probably was referring to in the original post is a one stateroom/one head boat with a completely different layout. 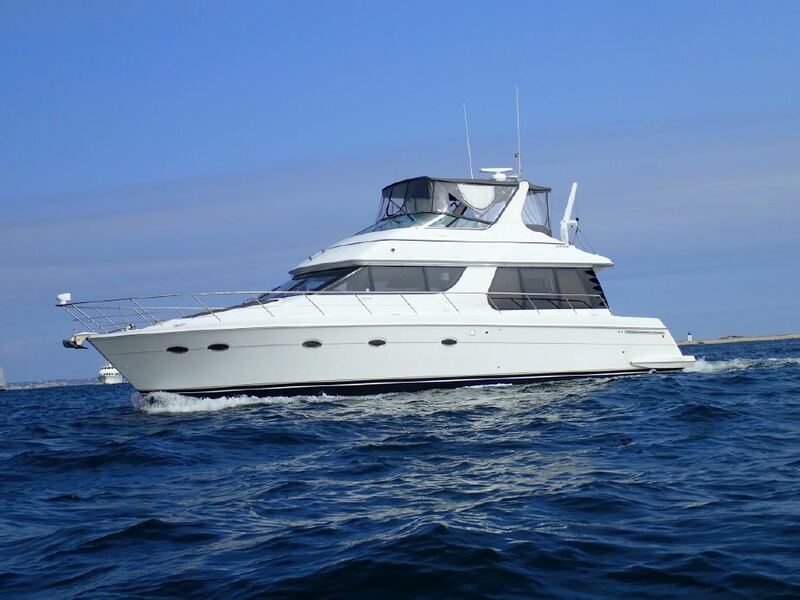 The family that bought it traded a Carver 506 Motor Yacht on it...they wanted to downsize. Ernesto, you're right. The 420 Express is a ONE Stateroom, One Head that gives much more room to the salon. I have not seen the Coupe but if it's 2 Staterooms then the room I'm talking about is gone. Then the 460 would be needed & I was not happy with the 460 layout? RamSport, I just came off a testdrive of a 420 with IPS...Very easy to handle, ride in a chop is a little wet unless you throttle down. No electronics on the boat so no spped could be determined but cruising at 2700 RPM was about 30 GPH on the Volvo Penta Engine gauges that's about half of what I burn now. Boat had plenty of speed and felt agile. Turns well no cavation on lean. Took a little longer then I'd expect to get on plane but all in all felt sturdy. I wish it had a sunroof but I'd not want a full roof or full glass. I like the feel of the wind & visabilty. For just the wife & I a great setup with a lot of room. One thing is the Stateroom, they could have given you a King size bed with the one cabin? Very tempting???? Anyone know the hull construction of this model? Is it full fiberglass? Built to what standard? "Solid fiberglass hull bottom with balsa cored hull sides"
"Stringers are fiberglass over foam"